You are at:Home»Cruise Lines»Disney Cruises»The Disney Dream is Born! The Disney Dream is Born! 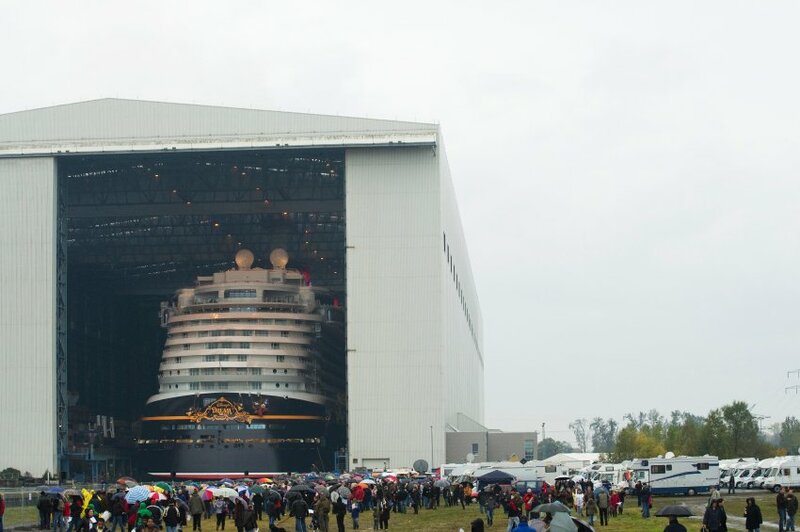 The Disney Dream is the biggest cruiseliner ever to be built in Germany and at the weekend, it finally emerged. The ship is now complete, and at 340 metres long with a capacity for around 4,000 guests – what a ship it is! The ship came out of it’s construction dock to a crowd of over 10,000 people and fireworks, the perfect debut for such a spectacular ship. I’m sure Mickey would be proud. The ship is one of the biggest in the world, with the majority of big cruiseliners only holding between 2,000 and 3,500 passengers. This new ship will be aimed at families predominantly (as you would expect from the Disney cruise line), however, there is also going to be lots for adults to do. Perhaps Disney can make their mark on the couples market with the Disney Dream? The ship has taken over 20 months to construct and with typical German efficiency, it has arrived right on time, ready to be handed over to Mickey and the gang in December. The Disney Dream will initially be offering cruises around the Caribbean. Disney are expanding rapidly over the next few years, with plans to double their cruise fleet from two to four by 2012. The German based firm which built the Disney Dream will also be responsible for building its sister ship – Disney Fantasy. As with all Disney ships, guests can expect some twists, some quirks and some surprises from the Disney Dream. Not a single detail on this ship has been left to chance and I’m sure you will fall in love with the Disney Magic, no matter how old you are!